Then line inside of a plastic medium size bowl wit tin foil n push it down hard. 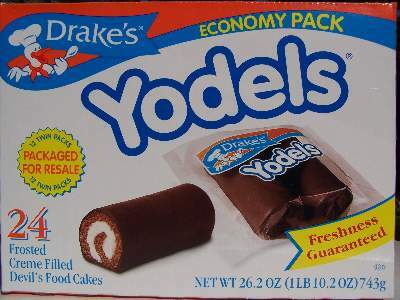 Take out yodels from freezer n cut them about a half inch thick. Push them down hard in bowl all around so all the tin foil and hole bowl is covered. Freeze for about half hour n let it freeze. Then take out and put one flavor of ice cream of your choice and full bowl half way. On top of that, put sprinkles and then freeze again for another half hour. Put a diff flavor iceream of your choice all the way to the top of the bowl and freeze again. When ready to serve take out 7 min before and put hot water in a pot and let the Yodel cake bowl sit in it so it warms up. Then take the platter and place the cake down on it ‘n bang it til its loose . This would be a great idea for a baby shower cake. Thank you and yes, cakes don’t have to be complicated. I don’t even understand how I ended up right here, but I believed this publish was good. I do not recognize who you might be however certainly you are going to a famous blogger should you are not already. Cheers! I made this for Shavuot and got oohs & aahs. Both kids & adults loved it. I used premium ice cream and i think that really makes the difference.